UsingDirectiveDecl should be Decl not NamedDecl, but we provide artificial names for all using-directives in order to store them in DeclContext effectively. Definition at line 2923 of file DeclCXX.h. Definition at line 3016 of file DeclCXX.h. Definition at line 3017 of file DeclCXX.h. Definition at line 2560 of file DeclCXX.cpp. Definition at line 2573 of file DeclCXX.cpp. Returns the common ancestor context of this using-directive and its nominated namespace. Definition at line 2990 of file DeclCXX.h. Definition at line 2991 of file DeclCXX.h. Returns the location of this using declaration's identifier. Definition at line 3001 of file DeclCXX.h. Returns the location of the namespace keyword. Definition at line 2998 of file DeclCXX.h. Definition at line 2581 of file DeclCXX.cpp. 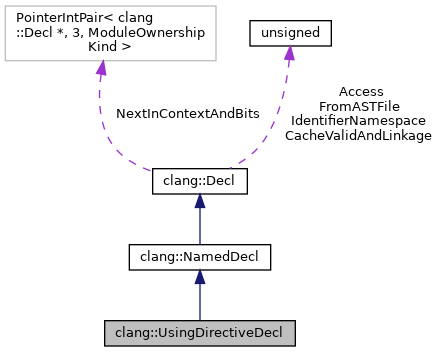 Referenced by clang::CodeGen::CGDebugInfo::EmitUsingDirective(), clang::ASTDeclWriter::VisitUsingDirectiveDecl(), and clang::TextNodeDumper::VisitUsingDirectiveDecl(). Definition at line 2984 of file DeclCXX.h. Definition at line 2976 of file DeclCXX.h. Definition at line 2977 of file DeclCXX.h. Retrieve the nested-name-specifier that qualifies the name of the namespace. Definition at line 2972 of file DeclCXX.h. Retrieve the nested-name-specifier that qualifies the name of the namespace, with source-location information. Definition at line 2968 of file DeclCXX.h. Definition at line 3012 of file DeclCXX.h. Return the location of the using keyword. Definition at line 2994 of file DeclCXX.h. Definition at line 2961 of file DeclCXX.h. Definition at line 2964 of file DeclCXX.h.